LittleShamrocks.com has recently become affiliated with Records Ireland, owned and operated by Hilda McGauley. Records Ireland is a professional genealogical research service providing accurate and timely searching of specific genealogical records including family research and specializing in certificates for Irish citizenship. Her decision to specialize in retrieval of specifically ordered records has allowed her to focus her service to clients, giving you the opportunity to direct your own research in a cost effective manner. Hilda McGauley has been involved in genealogical research since 1996. She is a member of the Association of Professional Genealogists in Ireland and has taken an active part in the Association's activities for many years. Hilda also works with the Genealogy Advisory Service at the National Archives of Ireland. 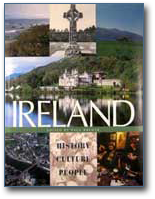 Records Ireland is easy to use and not as expensive as other genealogy search engines. The 'personal touch' is important to me, and I would be more likely to use Hilda's web site to research my Irish genealogy rather than a larger search engine such as Ancestry.com. I have had Hilda do a couple of searches and they have been successful, timely and cost effective. Records Ireland will carry out family research including birth, marriage, death, census, land and will record searches. Do you need a birth certificate of your Irish ancestor for your Irish Citizenship Application? 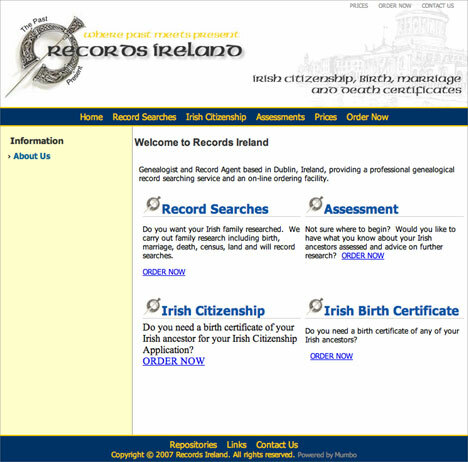 Irish Citizenship Services: Search for Birth record required for Irish Citizenship. 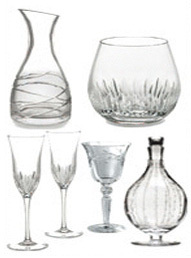 Click the image below to visit the Records Ireland web site. Ancestry.com does not have the personal touch of Records Ireland. The company is mainly a web site based collection of archive databases. Still the service could be a great way of tracing your family tree from Ireland to the States. Find your ancestors' stories among billions of historical records. Start your family tree. We'll start searching for your ancestors. Find genetic cousins and ancient family history with DNA Ancestry. Invite family members to view or contribute to your family tree. Order a personalized family history book or poster as a gift. Share your discoveries to help others in the Ancestry Community. Save records, photos and more in your free online family tree. 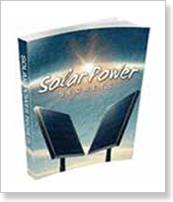 Preserve your story in print with a family history book or poster. Click the image below to visit the Ancestry.com web site.